Manhattan Borough President Gale Brewer is seeking a second term against three unknown candidates and being the Democrat incumbent, we’re sure she’ll clobber them. However, the fact is that it doesn’t matter who wins this race since the position is useless. The purpose is to be a cheerleader for one’s borough, appointing members to community boards and, if one is ambitious, coming up with ideas that hopefully City Council members will pick up. We like Brewer and that she’s so passionate about Manhattan’s mom-and-pops. But her position kind of handcuffs her from doing anything about this worsening crisis. She recently conducted a study of vacant storefronts and the results were not exactly shocking: Retail blight is getting worse. Her office didn’t respond when we asked what the next steps were on acting on this knowledge, and we’re guessing this is because there aren’t any. Brewer, previously an effective City Council member, should run for another position where she can actually make a difference. Also on the ballot is Stuyvesant Town small business owner and community activist Frank Scala. A good man we respect but we don’t know how he’d magically affect real change with such limited power, either. We endorse this plan and this candidate. I know we are supposed to feel grateful for only a $50 a month rent increase for “maintenance improvements.” Some might suggest common sense and that these maintenance items should be paid from our monthly rent. In any case, there are some significant day-to-day issues that most residents would like improved but few seem to have addressed. One is unsafe, substandard and hazardous pedestrian intersection ramp condition at intersections and crosswalks. The other is the loss of significant resident parking due to constant “temporary construction” of one sort or another and lack of government attention and repairs. Throughout our community at sidewalk intersection ramps poorly designed, unsafe physical conditions, and steep ramp angles create conditions for large water “ponding” to form (think ice skating in winter). This both blocks passage in warm weather rain and creates slipping conditions after practically every cold rain event. The “ponding” condition is worsened by the placement of Citi Bike stations that block drainage along street curbs. Worse yet, the steep pedestrian ramp angles lack adequate level and safe sidewalk refuge areas (particularly all along the 1st Ave. west sidewalk area – 15th to 22nd St.), and tripping hazards at pavement and curb intersection. Even in dry weather the most able of us have to be aware of these and other obstacles like phone/billboard obstructions, newspaper stanchions, and other street furniture that block and impede the 13 access nodes/locations surrounding our community. Fourteen intersection improvements for 25,000+ people shouldn’t be too difficult for our electeds. Here’s the list if they need: 14th St. at Ave. A, B and C; 1st Ave. at 14th, 16th, 18th, 20th and 23rd St.; 20th St. at Ave. A, B and C, and Ave. C at 23rd, 18th and 16th St. The fact is these pedestrian street crossing ramps do not assure disabled and aging community residents of a safe crossing let alone meet current engineering design standards (plus substandard federal, state, NYC DOT requirements). Once entering the street crosswalk one is presented with more dangerous crossing conditions; don’t even think of tripping here. The worst conditions exist at 1st Ave. at 14th and 20th Streets. Here it’s due to poor pavement conditions, utility manhole location hazards, the abrupt change in crosswalk elevations (urban hill and dale tripping hazards) and constant construction (destroying just finished improvements). These conditions are of course beyond the usual post winter pothole repairs. The forever bus stop construction project (over a year in the works) surrounding the busiest transit intersection at 14th St. and 1st. 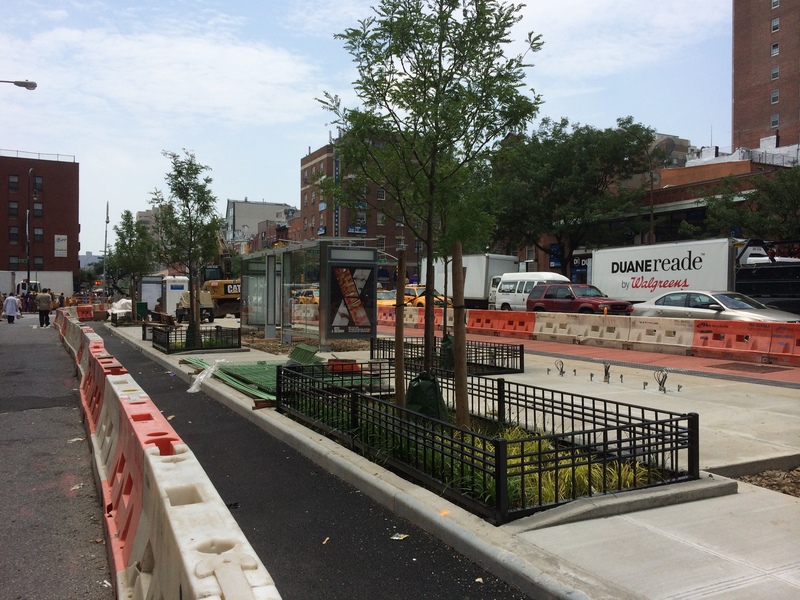 Ave has created more pedestrian safety issues and obstacles and further loss of resident parking.This particular project begins along 14th Street (in front of our closest and one of busiest MTA community bus stops) and extends along First Ave to 16th Street. So if you need to transfer from a 14th St. bus to 1st Ave. bus or from 14th St. “L” train stop, just hike on over to 16th Street. It’s comical if not a pathetic situation. Apparently, pedestrian walking hazards and residents driving in circles after work (yes there are jobs that are not near public transit or require private vehicles) in search for a parking space have escaped the attention of our local elected officials. Recently, we have lost significant parking along the entire First Ave. Loop road and created pedestrian obstacles with little or no mitigation. We have lost almost 200 parking spaces all 14th and 15th Street due to Con Ed. They said this was a terrorist hazard but only at this power pant. If you live in a public housing residence on 14th Street there is a good chance private, onsite parking is available for about $100 a month. Better yet for free on the non-terrorist side of the 14th Street power plant. 1. Improve all 14 intersections surrounding our community free of “ponding” and designed to meet NYC/S and federal pedestrian design standards. 2. Identify and create permanent and robust intersection crosswalks at major crossings in our community. Once completed, no major deconstruction work is allowed unless in extreme emergencies. This can be accomplished by building adequately sized utility access conduits (mini-tunnels) for future needs under these crosswalks. This would require an inter-department and public /private property coordination to establish future design and construction requirements and standards for access. Just think what we did in Times Square – we can do this here. Let’s start with 1st Ave. at 14th and 20th Street as a pilot. 3. Relocate all Citi Bike on street parking to city owned islands and wide sidewalk areas surrounding our community. That effort alone would regain about 30 to 40 permanent parking space for our community and improve drainage and intersection “ponding.” There are plenty of examples of this suggestion all around our community and city. (Hint, photos examples sent to our local officials). 4. Redesign and reopen hundreds of safe parking spaces along 14th and 15th Streets and still keep us safe from terrorists. An added benefit is pedestrian safety adjacent to our schools, parks, churches, and synagogues will be significantly improved and vehicular traffic reduced. Why? Because vehicles to and from the FDR Drive will have access to highway ramps that have been closed. 5. Contact our local electeds and Community Board 6 officers (some even live in our community) to act on your behalf to improve a few everyday community safety conditions. William Oddo is a Stuyvesant Town resident and founder of Stuyvesant Town Quiet Oval.